We got some snow in Cackalacky last week and Louie loved it! We didn’t get much at my end of the state, barely enough to cover the grass, but enough to have fun and make a bowl of snow cream. 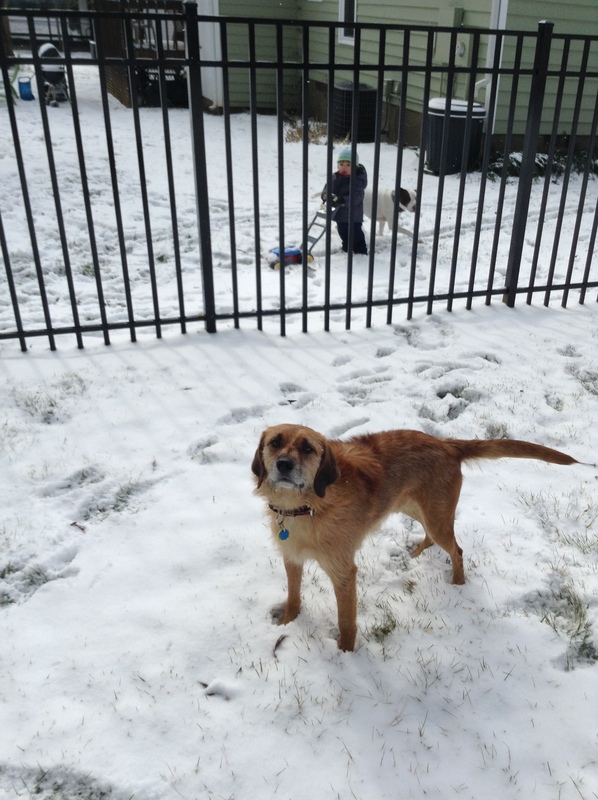 I got to work from home on Wednesday and I took some time to play with Louie in the snow. 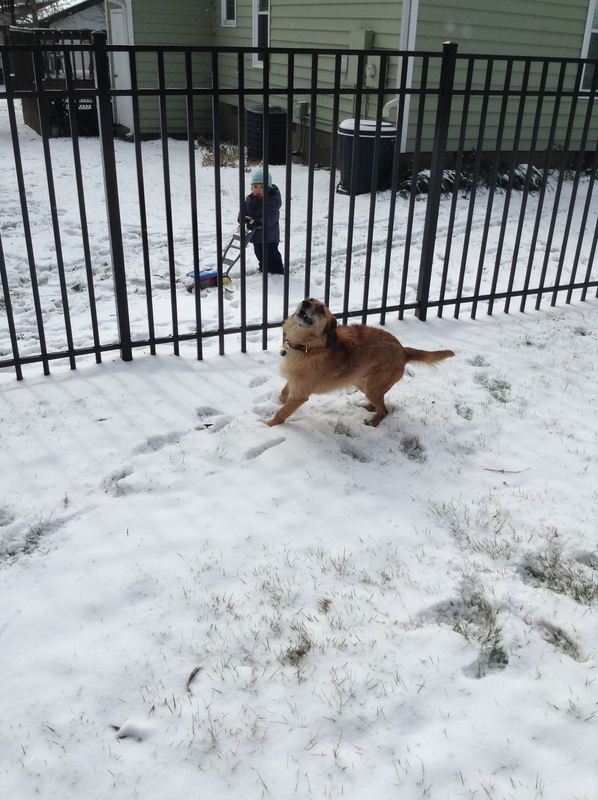 Louie celebrating the snow as Vance mows . . . 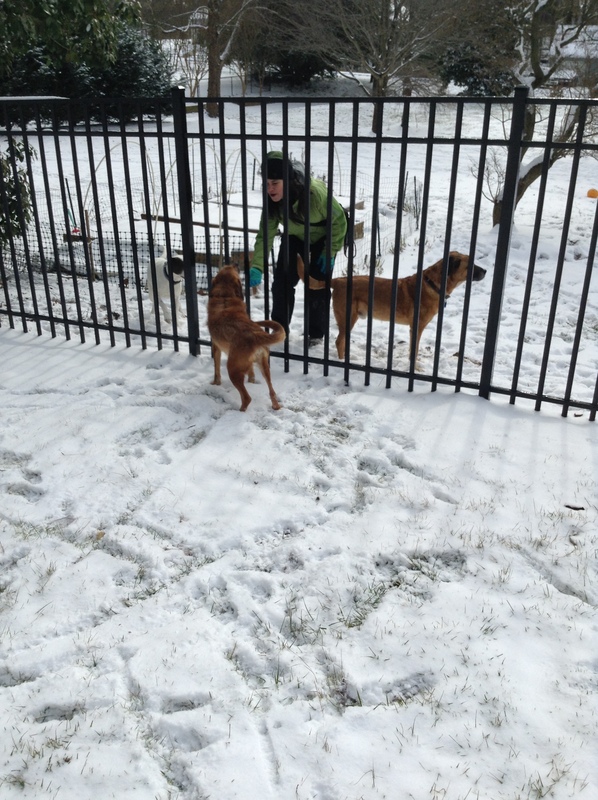 The fence was a good meeting place for Louie, Kenzie and Bourbon. This was a Kaffeeklatsch of K9 proportions but it wasn’t coffee that was flowing so freely, but what Frank Zappa warned us to avoid, lo, those many years ago. You may notice the stick marks in the snow. Louie loves to play with sticks; big ones, little ones, he plays with them all. 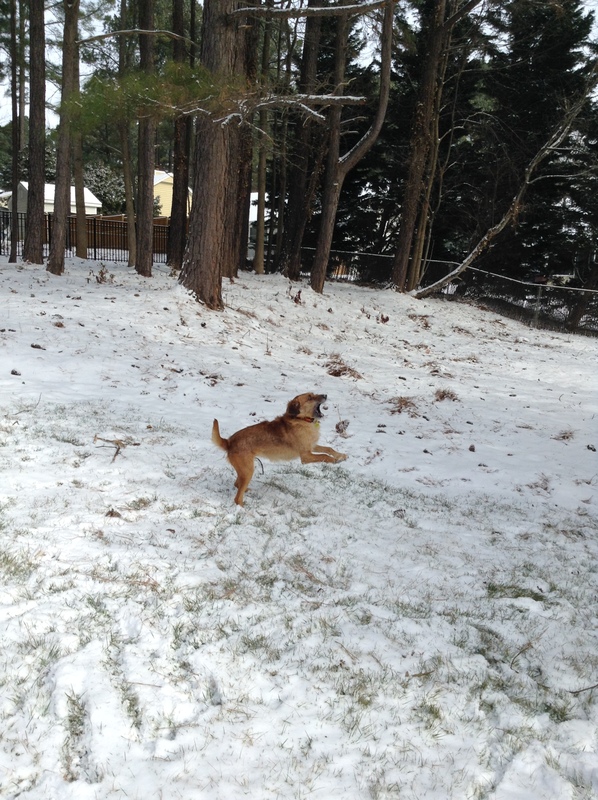 I do have a post about Louie and sticks that I will share at another time, but he was dragging around sticks and playing with pine cones in the snow. He also loves pine cones and tosses them around like a ball. 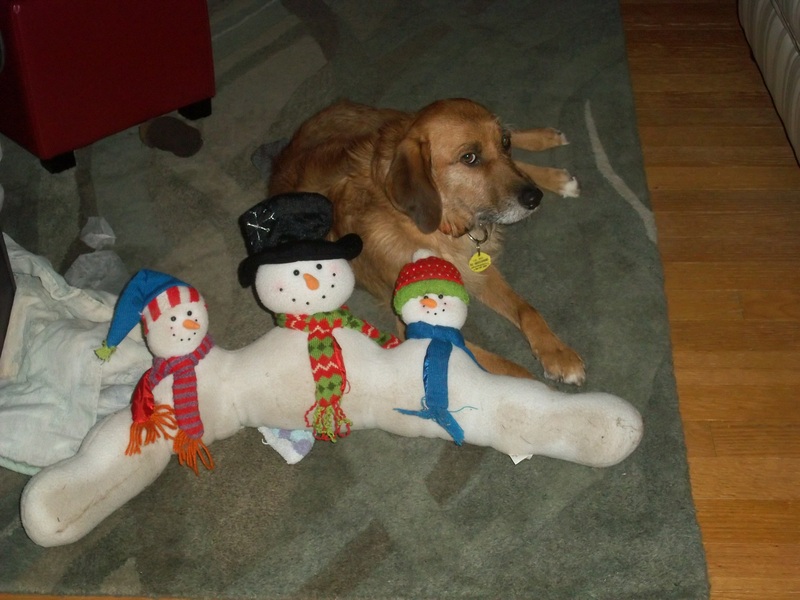 Remember last time I mentioned that in addition to herding my socks, Louie would manage to drag the snowman draft stopper over into his pile of sock booty? At that point I had never caught him in the act of getting the snowman over there, but I have now. He nonchalantly walks over and picks it up and takes it over to his lair. He even sits it upright. My snowman! Note they all have little hats on. Yikes, there was a snowman under there! He buried the snowman under the comforter, note there is no hat on the snowman on the right. 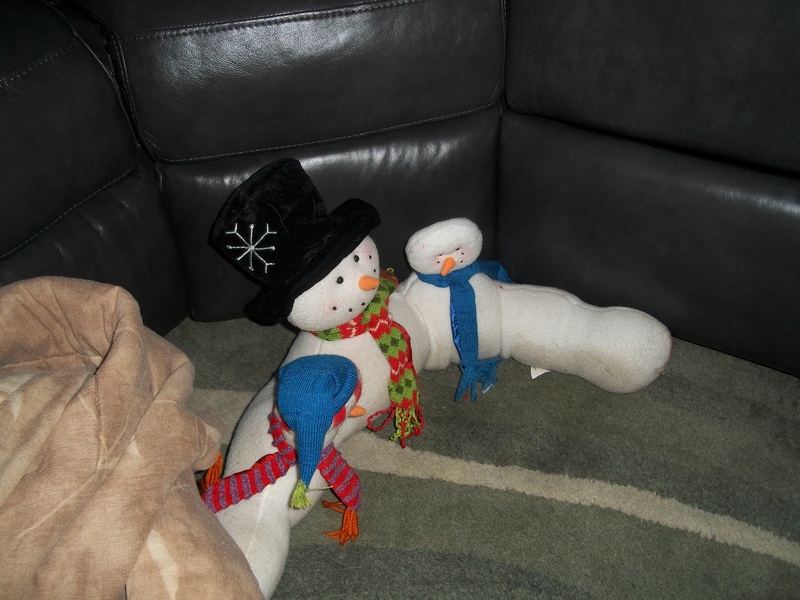 By the time I returned home from work the next day, the snowman was no more. Louie had pretty much eviscerated him. There were no hats left, no scarf or faces; only cloth and sandy entrails littered my living room floor. Out of respect for the family, I won’t post pictures of the remains. Louie digging the snow, in every sense of the word! Aside from losing the snowman, we had great fun in the snow. It’s finally warmed up to nearly 60 degrees which is my kind of winter day! So Louie and I are going to take our “constitutional” and check out the neighborhood while it’s so nice. Tomorrow is supposed to be rainy and only in the 40s, so we’ll take it while we can get it. This entry was posted in Uncategorized and tagged canine, dogs, Frank Zappa, Louie, snow. Bookmark the permalink.